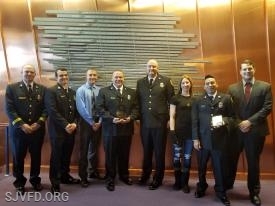 Become a Volunteer Firefighter or EMT! Want to serve your community? Want to work hard, gain valuable skills, and overcome new challenges? Consider joining Stonewall Jackson Volunteer Fire Department & Rescue Squad. Members receive free training, some tax relief, invaluable life skills, and so much more! The Stonewall Jackson Volunteer Fire Department and Rescue Squad has proudly served the citizens of Prince William County since April 1971. The department is dedicated to the preservation of life and property through education, quality emergency medical care, and effective fire suppression and hazard mitigation. Last year the department responded to over 5,000 calls for service. This would not have been possible without the support of our community. 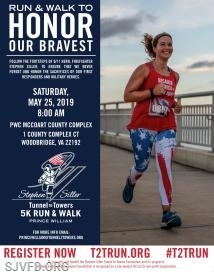 Please consider making a financial contribution below and help us continue to provide critical services to our community. 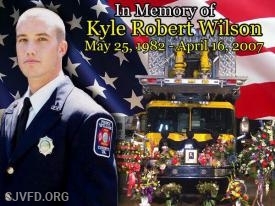 Today, we remember the life of Firefighter Kyle R. Wilson. Firefighter Wilson was killed in a house fire while searching for trapped occupants on April 16th 2007. Although Firefighter Wilson is gone, his memory and legacy lives on not only in Prince William County, but the Fire Service in its entirety. Hey Fireslayers and Lifesavers - Come to Firehouse Subs on Fridays, meal is on us! Spring has arrived and as the weather becomes warmer, households will turn off their home heating equipment and begin inserting window screens to enjoy the cool spring breeze that a screen provides. While screens for some may be comforting, for others they are dangerous even deadly especially for small children. Ever wonder what you should do with old/expired medications? We have a plan for that! You can drop off your old or expired medications in a safe, environmentally friendly manner!